What would Noah have seen while floating in the ark during the Great Flood of Genesis 6-8? He tells us that the waters covered every high mountain under the whole heavens (Gen. 7:19). Clearly this refers to a Flood that covered the entire planet. Or does it? Was Noah even familiar with the enitre planet's geography? Probably not, but in any case, he most likely saw a sight similar to the picture above. This picture was taken from a vantage point where the waters covered everything under the entire sky. There was no sight of land anywere in any direction. Now we know that Noah did not have a world map with him on the ark. He did not have GPS, or a compass, all he had were the stars and the promise of deliverence from God (Gen. 6:18). From Noah's vantage point, everything under the sky was covered with water; just like in the photo above. However, if one were to get out of the boat here, they could probably still stand up and walk if they had to. 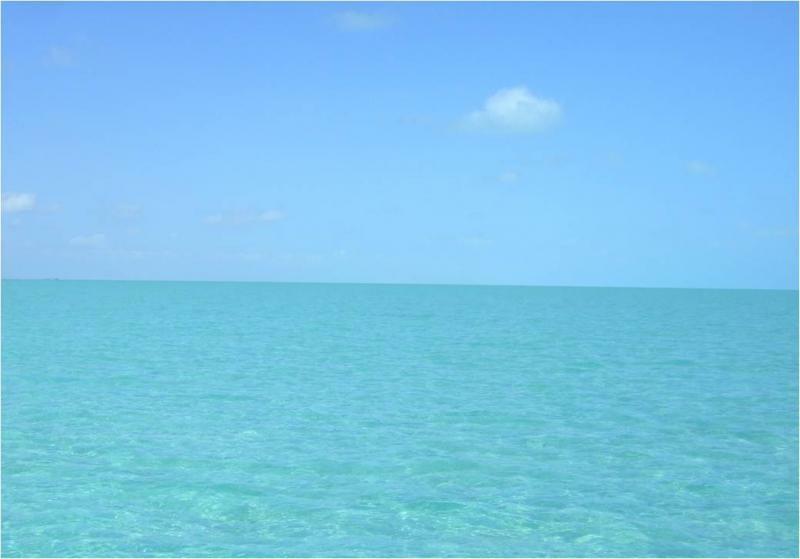 The water depth here is about four feet, and a few miles to the north lie the main islands of the Turks and Caicos. The water that seemed to cover the earth from our perspective only covered a portion of it in actuality. The language we would use to describe what we saw though, could give an unfamiliar listener the impression that water covered everything. Just what happened in the Flood account in Genesis 6-8 has been the subject of much debate. The dominant position throughout church history has been that the Flood was global in extent. Additionally, with the rise of modern geology, many commentators have claimed that the Flood was responsible for nearly all of the geologic strata on earth. Others though have suggested the text speaks of a local Flood; one that left little to no geologic footprint. So which is the correct interpretation? We will here examine the biblical account in search of answers, independent of any geologic data. The association of geology with the Flood and its interpretation will be discussed on the Flood Geology Challenges page. What was the purpose of the Flood? What was the timeline for the Flood? Are there any biblical arguments for a local Flood? What was the water depth of the Flood? Does the Bible mention any geologic effects of the Flood? Verse 5 gives the reason for the Flood (the wickedness of man was great in the earth). Verse 6 gives Yahweh’s response to man’s wickedness (it grieved Him to His heart). Verse 7 then give the sentence of judgment that is the Flood (I will blot out man whom I have created from the face of the land). There should then be no argument over the clear purpose of the Flood: to blot out man from the land. Any attempt to add to this purpose to include any notion of geographic extent of geologic activity is to go dangerously beyond the text. 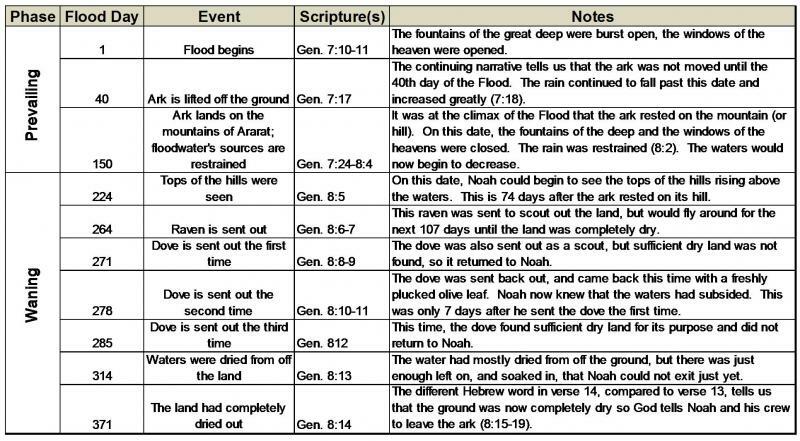 The next part of our synthesis will include the timeline of the Flood as given in Scripture. See the summary chart below. With the clear purpose of the Flood stated, and its chronology outlined from Scripture, we may now begin to address the geographic extent of the Flood. The traditional and historically accepted interpretation of the Flood narrative is that it covered the entire planet. In the last few centuries, however, many have challenged that notion based on a deeper understanding of God’s Word and His Creation. In the ﻿exegetical commentary﻿, I have brought out clues carefully from the text that support this notion that the Flood was only locally contained. Below is a list of those observations. God tells Noah He is about to destroy the earth (6:13). We know that the earth remains (8:22), so this must be referring to a local piece of “land”. God tells Noah to line the ark inside and out with “pitch” (6:14). The proper understanding of this is that it is a secondary petroleum product. This means that enough of the fossil record was present prior to the Flood to result in the “pitch” which would waterproof the ark. The Flood was therefore NOT the cause of the entire global fossil record. See also the exegetical commentary on Genesis 14:10 for more information on this "pitch" and how it is part of God's great provision for mankind. God said that everything that is on the earth shall die (6:17). We know that plants, fish and microorganisms did not perish and thrive today, so the extent of the word “earth” (erets) MUST have been local and does not speak of the entire globe, or else God lied to Noah. The only other literal and historical reference to “the great deep” (7:11) in Scripture is in Is. 51:10 where it refers to the Red Sea (a local reference). The word “deep” can refer to the oceans, but it can also speak of groundwater (see Ps. 78:15). It need not refer to the global oceans. The word for “burst forth” (7:11) does imply geologic activity, but is predominantly used in local settings such as the waters of the Red Sea “splitting” for the Israelites in Ex. 14:16; Ps. 78:13; Is. 63:12; the splitting of the rock for the water to gush out for the wandering Israelites (Is. 48:21; Ps. 78:15-to provide waters as from the deep); or the splitting of the ground (presumably an earthquake) (Num. 16:31; Mic. 1:4; Zech. 14:4). The word used for rain (7:12) is the word the Hebrews used to describe the heavy but seasonal winter rains (cf. Ezra 10:9 & Song 2:11). This would infer that they were familiar with rains of this magnitude. We know from the Hebrew that the ark was not lifted off the ground until the 40th day of the Flood (7:17). Assuming 23 feet of water was necessary to make the ark float (half the height of 45 feet), that amounts to roughly 6 inches of water accumulation per day for the first 40 days. This rate of water accumulation could NOT have flooded the globe, nor could it have any tectonic significance if it could not even lift the ark off the ground. The Flood, therefore, must have been local in geographic extent. From the chronological sequence of wayyiqtol verbs, we know that “all flesh died” only after the water rose above the hilltops (7:20-21). This is only possibly in a local Flood. The reason being that the last remaining survivors would have fled to the hills to escape. They hardly would have climbed Mt. Everest to escape the Flood! Again, the Hebrew tells us this Flood was localized and the hills that were covered were within reach of humans. The ark rested on the hills of Ararat (8:4) on the 150th day. The tops of the hills became visible 74 days later (8:5). This is only possible in a local Flood with a local perspective (i.e. Noah’s). If the Flood was global, it demands a global perspective (i.e. God’s). If the perspective were global then that means that the ark rested on the hills of Ararat BEFORE Mt. Everest “popped up” above sea level. This is impossible because Everest is almost 13,000 feet higher than any peak near Ararat. There is no evidence that Everest was not at nearly its present height before the Flood. In fact, the text demands that it was. Since there are marine fossils on Everest’s peak, it was once at the sea bottom. 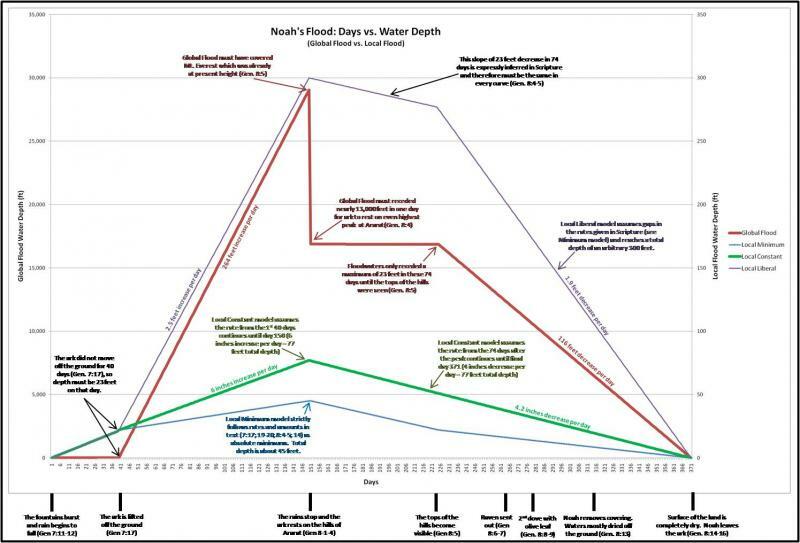 If the Flood were global, its peak must have “shot up” rapidly almost 3 miles in just 74 days! There is no indication from the text that anything like this happened. In fact, the Bible tells us that any possible tectonic forces (the bursting fountains) were shut off before this could happen. Again, the Bible gives us clues that the Flood was geographically local. The only way this could make sense is that the floodwaters reduced a maximum of 23 feet (half the height of the ark) after the ark rested on the hill in the next 74 days to make that hill become visible. That is a very reasonable 4 inches per day. The text says that Noah sent out a raven 40 days after the tops of the hills were seen, but the raven flew “to and fro” until the waters were dried up completely (8:6-7). It did not find sufficient exposed land to settle down. This implies that the waters only decreased slightly in this 40 days. If the subsequent rate of 4 inches per day continued, then the waters would have only gone down another 13 feet in the 40 days. This seems to fit with the raven not finding much land on which to live. In 8:8-9, Noah sends out the first dove to see if the waters subsided sufficiently. The dove found no place to rest because the waters were “still on the face of the whole earth”. Again, Scripture contradicts Scripture if this Flood were global because in 8:5 it says that the tops of the hills were seen. Therefore, the “whole earth” ONLY can refer to the land where Noah would later disembark (i.e. the valley below the hills). This is yet another case where global-sounding English words do not refer to the whole planet, but a small local piece of it. The global Flood theory again contradicts the Bible. As the dove went out the second time, the Hebrew tells us it picked off a fresh olive leaf (8:11). This olive tree could not have survived a global Flood, and it could not have floated as a seed and implanted itself in a rocky mountain cliff face as some have suggested, and then grew and sprouted leaves in just seven days! Rather, the only explanation is that this olive tree survived the Flood as logically inferred from Noah’s reaction that he knew the waters had subsided from the land (this comment makes no sense if the Flood were global because he already knew that some land was exposed, and it would still be a few months before he could get off the ark). This olive tree would have quickly rejuvenated itself at the sight of the sun after its watery burial for the past few months. This is only possible in a local Flood of minimal water depths and minimal energy so as to not bury the tree with excessive sediment. Noah sent this dove out a third time and it did not return to him (8:12). This is only 14 days after it found no land to rest on, and 7 days after it picked the fresh olive leaf. From the known decrease rate of 4 inches of water per day in the first 74 days of the waning phase (8:4-5), there must have been a rapid increase in the reduction rate for the rest of the Flood. Additionally the dove must have been released at just the right time to not see the olive tree (8:8-9), then to see it seven days later (8:10-11), then to find enough land to survive just seven days later still (8:12). Well over a thousand feet of water had to have decreased in just that 2 week period in the global Flood model! Not to mention the rapid soil formation inferred to grow the olive tree as depicted in Scripture. This “jerky” sea level curve is not inferred anywhere in the text, and is not desired as a feasible interpretation. In the local Flood model, the few feet to tens of feet of water recession would satisfy the Scriptural requirements, and this rate is in line with the other rates given throughout the Flood narrative. Verse 13 of Chapter 8 tells us that the waters were dried up from off the earth. This can only be true if the Flood were local in extent, because we know the earth is not dry now, nor was it then. Additionally, this reference to “the earth” is later defined as just “the ground” in part “b” of the verse. This implies that most of the water was gone, but perhaps the ground was still drenched with water enough for Noah and his family to remain on the ark. The “earth” had completely dried out as the Hebrew wording tells us in 8:14. We know this must refer to a local portion of “earth” because the planet is not completely dry today. This infers that the local area around Noah and the ark was so completely dry that it was safe for them to exit the ark. There was no need to wait until South America was completely dry for Noah to disembark. Therefore this reference is to a local Flood and a local drying. Remarkably, if we use the rates of water increase and decrease inferred from just the biblical text itself (given in 7:17, 19-20; 8:4-5), we arrive at a very consistent water level curve of six inches per day increase and just over four inches per day decrease. Based on the timeline give in Scripture, this comes to a Flood depth of around 77 feet. This depth may be on the pessimistic side, but it is very reasonable to fulfill the purpose of the Flood. We cannot ignore the Scriptural clues given in regard to rates of increase and decrease as they reach nearly the same number of 75-77 feet! We have seen that the English translations give an overwhelming notion that the entire planet was covered with water, even over the highest mountains at 29,000 feet above sea level. However, the original language and logistical issues regarding water depth and energy seem to point towards a local extent. We have also noted the difference between a “global” Flood and a “universal” Flood. The Bible leaves no doubt that the Flood was universal. That is, it completely fulfilled its purpose which was to wipe out the corrupt human population (6:5-7, 13). This fact is told here and is reiterated in the New Testament (1Pet. 3:20; 2Pet 2:5). To have a local Flood that fulfilled this requirement means that the earth’s human population was relatively small and was localized to one area. Is there any evidence of this in Scripture? Interestingly enough, there is. After the Flood in Genesis 11:1 it says that the “whole earth used the same language and the same words”. The very next verse says that “they journeyed east” to a “plain in the land of Shinar”. The word ”they” obviously refers to “the whole earth (erets)” in the preceding verse. As we have seen above, erets can mean either the global earth, a local piece of land or a people group. The latter is intended here, and this suggests that the entire population was together, and they migrated to a plain. The reasons for migrating to a plain are obvious for water and farming resources. Additionally, it says later in 11:3 that they did not want to be scattered over the face of the earth. This means it was their desire NOT to spread apart. This is in direct contradiction to God’s command to Adam (Gen. 1:28) and to Noah (Gen. 9:1). Man was never willing to obey this command for some reason. God knew that if the population insisted on sticking together they would get proud and join forces and try to become greater than their Creator. That’s exactly what happened at the Tower of Babel. As a consequence, God mixed their languages and forced His unwilling creatures to disperse and fill the globe (Gen. 11:8-9). It was not until after the mixing of languages that man migrated to the far reaches of the planet. With a common language, it was man’s prerogative to stick together and flock to the lowlands. So then we have a biblical analogy to the human social and behavioral patterns in the pre-Babel world. Prior to the Flood, all people had one language, and they corrupted themselves. By all being in the same geographical lowland, they became an easy target for God’s Flood. There was no escape, and there was no reason to flood the outer reaches of the globe where there were no corrupt people groups. What then of the population that fell during the Flood? It has been argued from the YEC side that there could have been over 1 billion people on the earth at the time of the Flood. This argument also assumes there are no gaps in the genealogy on Genesis 5. In this genealogy we find that all of the patriarchs had sons and daughters in addition to the main son in the line. Calculations can be made to show a population in the hundreds of millions to over a billion, but this involves assumptions that are not found or even warranted in the text. Instead, we should look for clues in the text itself. As stated above, Genesis 6:1 says that the Flood narrative commences when man “began to multiply across the face of the land”. This takes place exactly 120 years before the Flood (6:3). It would appear then, no matter how many ways you calculate it, the population up until this time, no matter how long the time had been, was constant to only modestly increasing. Also, Noah did not have children until he was 500 years old (Gen. 5:32), and he only had 3 sons. While he may be an exception, the fact remains that people did not multiply before this time. This is in direct disobedience to God’s command in Chapter 1 verse 28. The Hebrew word for “multiply” in this instance shares a root with the word for “ten thousand”. While not to be taken literally, it may give an approximation for the earth’s population as “in the tens of thousands”. With all this biblical evidence in mind, we can now be confident that the human population was NOT in the hundreds of millions to billions. We cannot take recent population statistics and in anyway apply them to Noah’s day. This is not only illogical, it ignores the text of the Scriptures. The world population did not hit 1 billion people until around 1820 (an absolute minimum of 4,500 years after the Flood). It is therefore inconceivable that the population could have been anywhere near that high before the Flood. Rather the biblical data point to a relatively small human population that shared a common language and all lived together in the same geographical area. The only possible reference to a geologic process given is actually the main cause of the Flood; the bursting forth of the fountains of the great deep. As mentioned above, it seems likely this is the breaking of some part of the land surface to release water from some container. This container could be a natural dam that broke to release its reservoir as can be seen throughout the recent geologic record. Or, possibly it could be the release of springs or geysers from an earthquake cracking the reservoir’s seal. Either way, the terminology used most likely refers to a geologic event based on its usage in other places in Scripture. If we are honest, there are no other specific clues that have any geologic implications. Any attempt to find worldwide tectonic, sedimentation and erosion events in this text is special pleading that takes us way beyond the text. ﻿﻿So, the next logical questions would be, “What geologic evidence did the Flood leave behind?” and, “Where is the Flood located in the geologic column?” Many people have tried to place the Flood at different places in the geologic column. Every place seems to have profound problems when looked at on a global scale, however. The problem has been the lack of a good working model for the geologic implications of the Flood. Now that we have a solid working model, we can answer these two questions. Based on the biblical text, the Flood affected a very limited part of land, and was only about 75 to a maximum of a few hundred feet deep. Therefore, it should have left very little geologic evidence, perhaps only a thin layer of silt and mud. As to where this layer would fit in the geologic column, the Bible gives us clues. Human beings were the target of God’s watery judgment, so the Flood cannot be lower than their first appearance in the column. And, since the rise in water level may have been caused by the glacial cycles (i.e. melting and dam breeching, which is common in the recent geologic past), it most likely occurred during the last few tens of thousands of years. This would place the Flood in the uppermost part of the Pleistocene Epoch on the geologic column. In my studies, this appears to be the only place it could be put without contradicting either the Bible or the rock record. It should be noted now that the entire synopsis of Genesis 6-8 above has dealt strictly with the biblical text. Most Global Flood advocates have suggested that Christians who promote a local Flood do so not based on the Bible, but based on the word of secular scientists who say the earth is billions of years old. They are therefore called “Compromising Christians”. The compromise is that of the authority of God’s Word, and is therefore condemned and given as a warning to all who might be swayed in that direction. This commentary serves as a direct rebuttal to that notion, as the ideas formulated here come ONLY from the Scriptures. The Bible clearly was not conveying the idea of a global Flood that resulted in vast tectonic upheavals of the earth’s crust, and sent continents hurtling towards one another to rapidly form the highest peaks we see today. That idea is not presented in Scripture, and would have made absolutely no sense to a 15th Century B.C. Israelite listening to Moses dictate the words of this account.